I am a bad blogger. I should be fired, but I guess I would have to fire myself and that’s not going to happen, so you are stuck with me. I apologize for my disappearance but I was sequestered for a month and a half in the middle of nowhere Pawhuska, OK helping feed some hungry folks. Unfortunately, I can’t give you any dish, good or bad. I can say it was quite an experience. I made new friends and met a lot of interesting people; however, I am happy to be home and resuming my regularly-scheduled life. After finishing a marathon of working like a dog for a month and a half, an impromptu trip to Florida and Thanksgiving I needed to take some time to recover. So, for three days I slept in, rolled out of bed and played Xbox. It was pretty awesome. However, after three days of wearing my husband’s flannel pajamas and playing copious amounts of Assassins Creed III, it was time for me to reenter adult life. There was a mound of laundry, dishes in the sink and a pillaged pantry that needed restocking. So I showered, brushed my rat’s nest, put on some clothes appropriate for public viewing and headed out to the grocery store. While I was stocking up on the essentials, I decided to peruse the meat department. Then there they were, beautiful beef shanks eyeing me through the window like a cute puppy begging me to take them home. (Because we all know I need another dog.) It had been so long since I had been in the kitchen just for fun and I had been craving something really beefy and filling. It was obvious to me that these beef shanks and I were destined to find each other. With the beef shanks in my cart, I continued to stroll through the grocery store looking for inspiration. I picked up some fresh herbs, apple cider and heavy cream among other things. I was suddenly flooded with ideas. Perusing the grocery store will do that to me sometimes — it’s like my own therapy session. 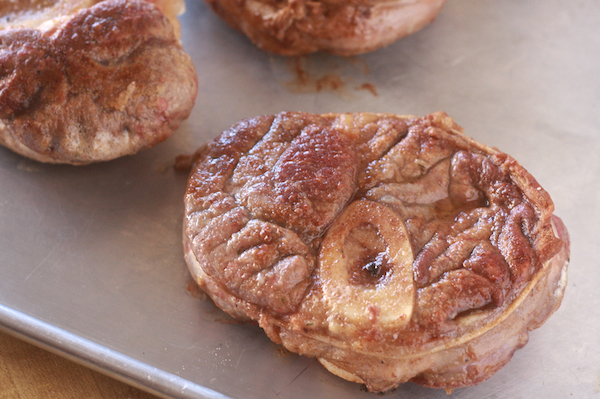 Take your beef doughnuts and tie butcher’s twine around them. Heat a heavy oven-proof pot or Dutch oven over medium-high heat. Melt 5 tablespoons of butter. 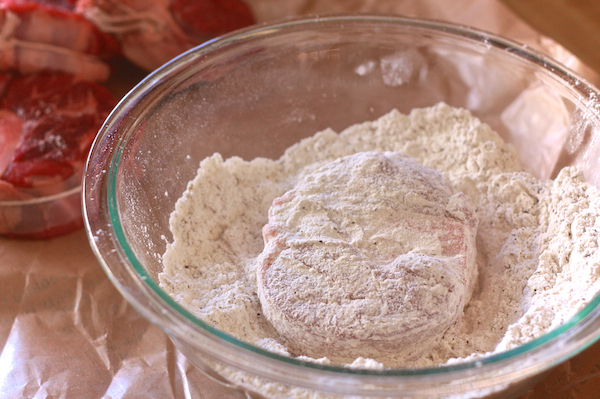 While the butter is melting, lightly flour the shanks in seasoned flour. 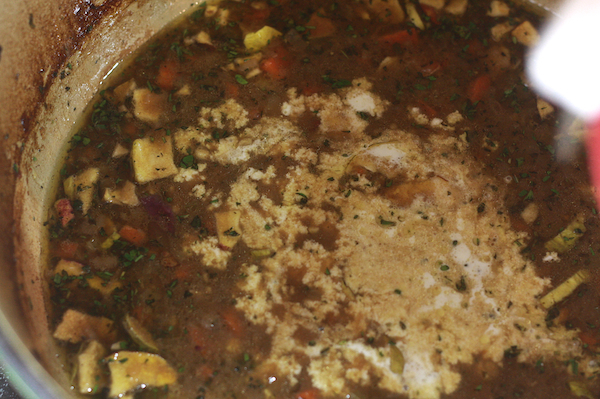 When the butter is completely melted and just starting to change color, add the shanks to the pot. Make sure you don’t overcrowd the pot and resist the urge to fidget with them. Let them sear until brown and crispy, about 4 minutes on each side, and set aside. 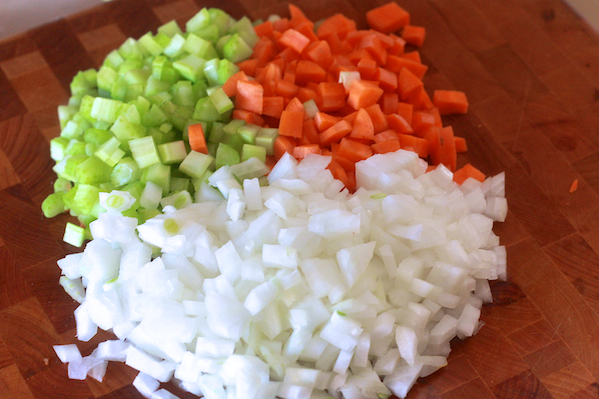 Any time I am making a soup or braising a dish I start with a mirepoix. For this dish I used just over 1 cup of mirepoix or 1/2 cup onions, 1/4 cup carrots and 1/4 cup celery. 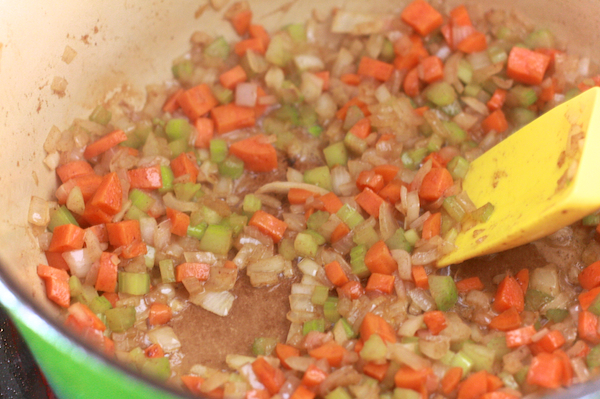 Mirepoix is 25% carrots, 25% celery and 50% onions. It doesn’t have to be exact, but it’s the base to everything savory and delicious in the world. Add the mirepoix to the pot. The butter will be dark and brown by this point. Stir and sauté until the vegetables are tender. 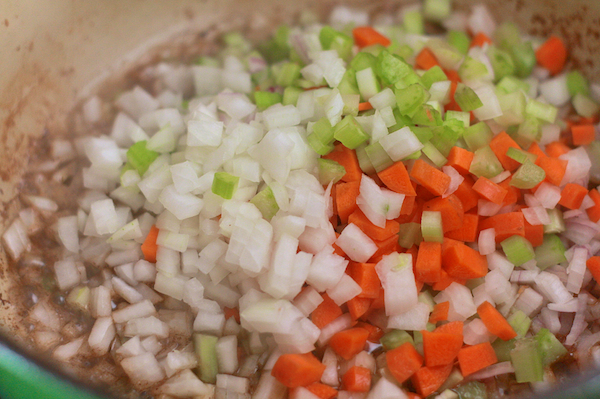 Once the mirepoix is tender, return the beef shanks to the pot. 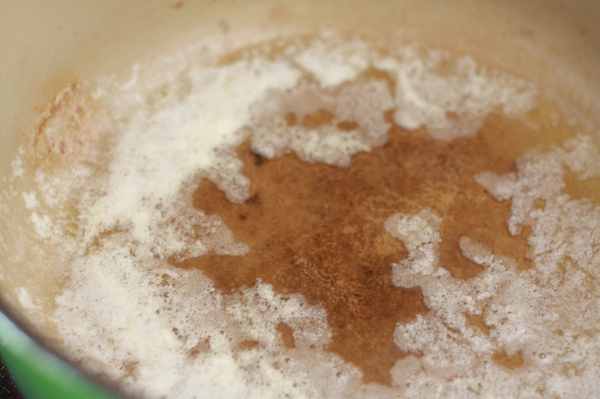 Add 2 cups of apple cider, 1 cup of chicken stock and 1/2 cup of white wine, bring to a boil and let it reduce by about half. Add your bundle of herbs – 1 sprig of rosemary, 2 springs of thyme and 2 springs of marjoram. Cover with the lid slightly askew and place in a preheated 325-degree oven for about 1.5 hours or until tender. 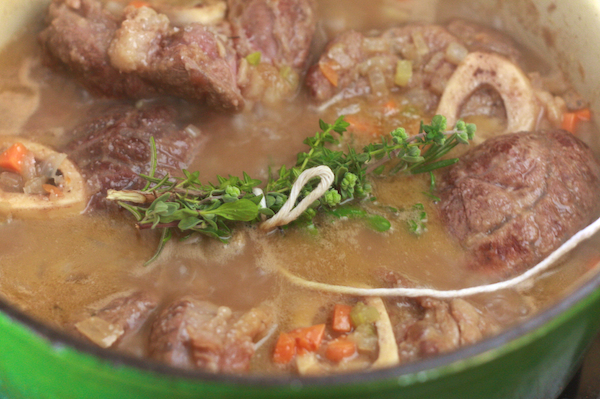 Once the beef shanks are tender and falling off the bone, remove the herb bundle and set aside the beef shanks. Add 1 1/2 tsp of fresh minced thyme, 1 1/2 tsp fresh minced rosemary, 1 1/2 tsp fresh minced marjoram, 1/4 cup of crushed apple chips and stir. With the pot set on a low heat whisk in 1/4 cup of heavy cream until well combined. Continuing to whisk the sauce, bring it to a low boil. 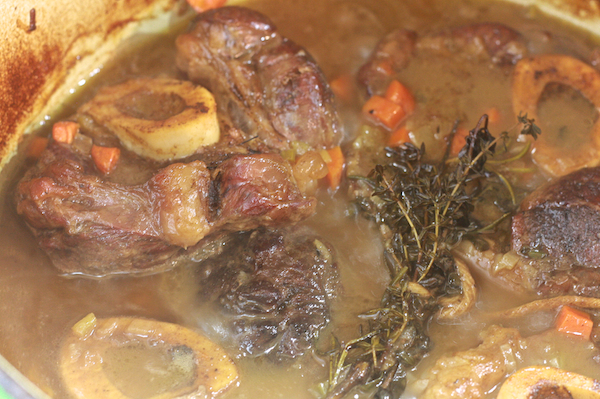 Return the beef shanks to the pot to reheat and serve. 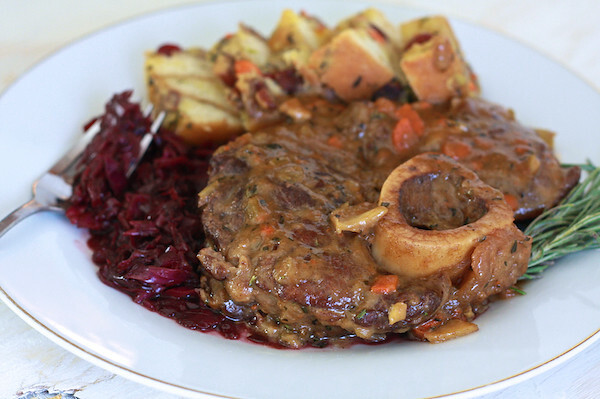 I served the beef shanks with some savory bread pudding and braised red cabbage. Both recipes coming soon to The Noshery. I could not have been happier with the result, a hearty beef and herb flavor with a touch of sweetness. 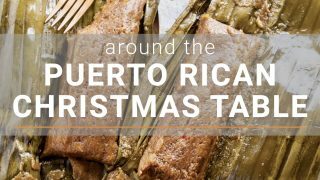 It’s the perfect dish for a cold winter day or to impress your guests at your next holiday party. Granted, you will need to jog the circumference of the earth afterward, but I promise you it will be worth it. If you’re really daring, I would highly recommend digging into the center of the bone for the marrow. It’s like delicious beef butter. 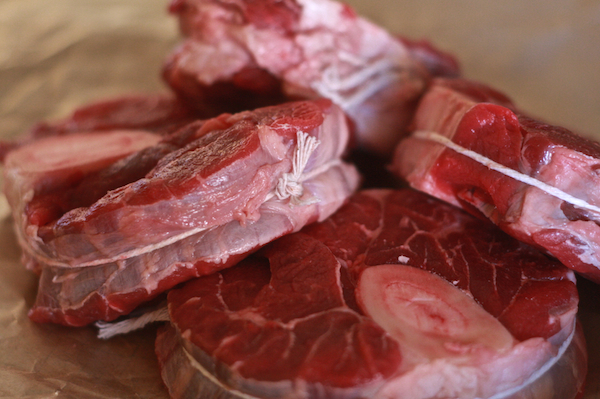 Tie butcher's twine around the edges of the beef shanks. In a large bowl, combine flour with salt, pepper, dry thyme and rubbing sage. Mix until well-combined. 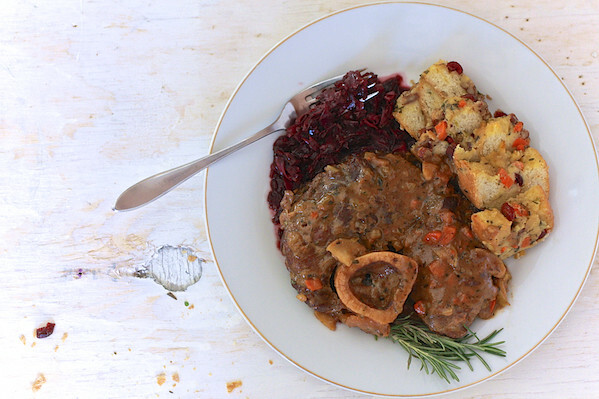 Coat the beef shanks with flour, shaking off any excess, set aside. Melt butter in a heated, heavy bottom pot or dutch oven over medium-high heat. When butter is beginning to brown, add beef shanks, making sure to not overcrowd the pan. You may have to do this in two batches. 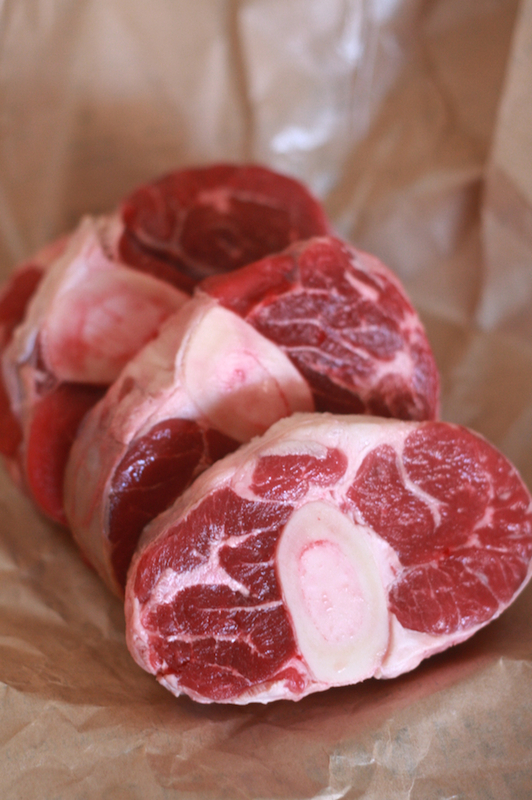 Brown shanks on each side for 4 minutes or until brown and crusted on each side. (Try your best not to fidget with them.) Set browned shanks aside on a plate. Add onions, celery and carrots, saute until tender, about 10 minutes. Return shanks to the pot, add apple cider, stock and wine. Bring to a boil, uncovered and reduce by about half. Add fresh herb bundle, cover and place in oven for 1 1/2 hours or until the shanks are tender. 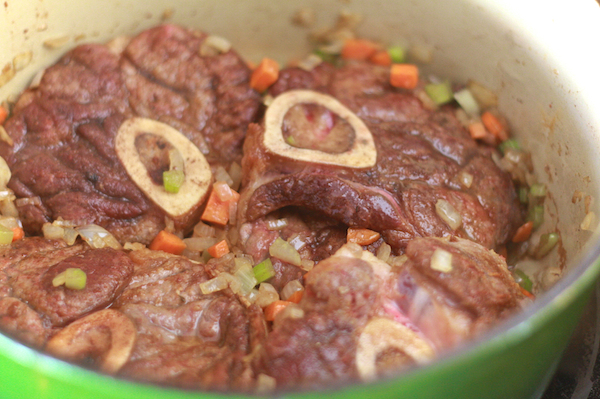 Once the beef shanks are ready, return the pot to the stove and set on low heat. Remove the shanks from the pot and set aside. 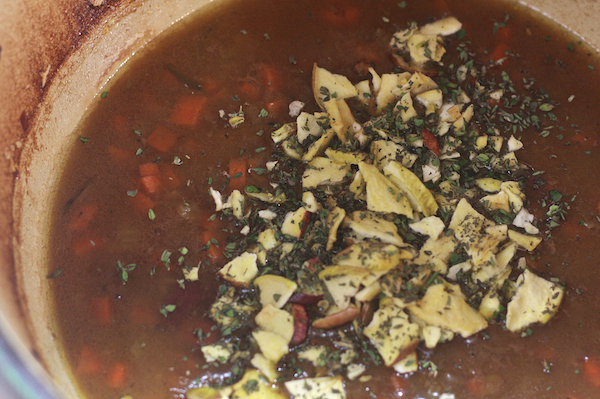 Add fresh minced herbs, crushed apple chips and heavy cream to the sauce. Whisk until well-combined and the sauce reaches a low boil. Serve shanks drizzled with creamy herb sauce. Did you ever post your recipe for braised red cabbage? Like osso bucco with beef, I love it! Assassins Creed III was the king for our boys but then Black Ops came out again. I’m glad to see you’re back, and bearing the gift of another delicious recipe. 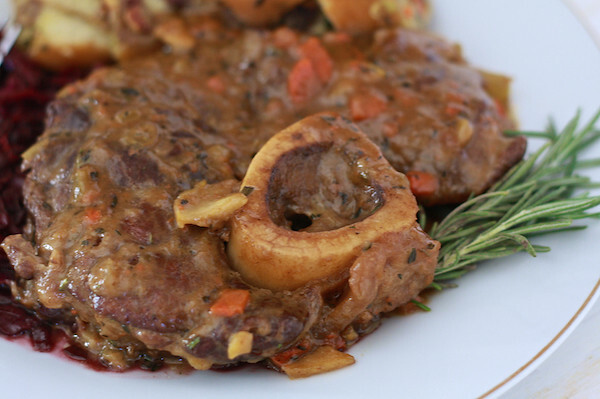 I had been pretty sure I was going to make your Malta pot roast for my husband’s birthday next week, but these shanks sound so good I’m eager to try them right away… This is quite the tasty challenge.